I really like Lion’s full screen applications feature. Typically I run four “desktops.” The first is the main desktop for OS X, then on the right I have a blank desktop that I use as a space for applications with a lot of windows. I then run Mail and Evernote in full screen in the last two desktops. I like the order they’re in—Desktop 1, Desktop 2, Mail, Evernote. The problem is that if I am on Desktop 1 and I click Evernote from the Dock to switch to it, switching reorders the desktop arrangement—shifting Evernote to the position after Desktop 1. I’m tired of constantly rearranging these spaces. Shouldn’t I be able to keep them in the original order? You absolutely should and you absolutely can. 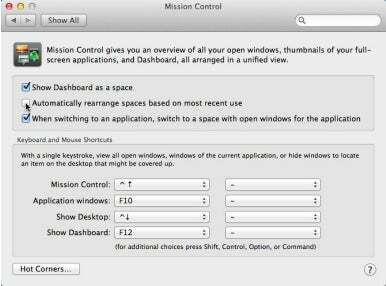 All you have to do is launch System Preferences, select Mission Control, and uncheck the Automatically Rearrange Spaces Based on Most Recent Use option. When you do that, you can use the Dock to switch to different desktop spaces with the confidence that all your spaces will remain exactly as you originally configured them. Of course you still have the option to manually rearrange them by calling up Mission Control and dragging the resulting spaces to different positions. With that Automatically Rearrange option off the desktops will remain in the new order you imposed.